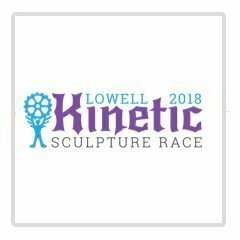 Lowell's Kinetic Sculpture Race - Boston GreenFest - Aug. 16-18, 2019 - FREE! From the crossroads of Science, Technology, Engineering, Art and Mathematics comes a spectacular racing spectacle! The first Kinetic Sculpture Race was held in 1969 in Ferndale, California. Local artist Hobart Brown decided to upgrade his son Justin’s tricycle, and by the time he was done, he had added a great deal of material including two more wheels. 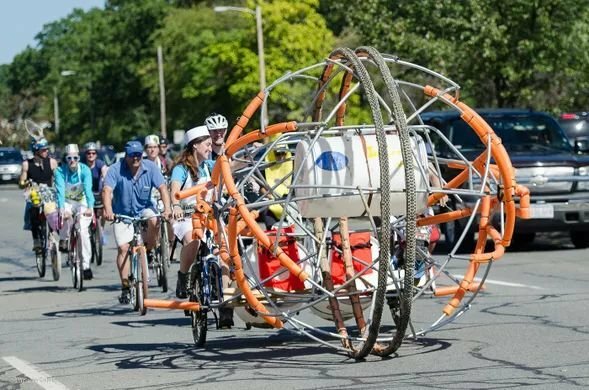 His neighbor Jack Mays thought he could make something better than Hobart’s “Pentacycle,” and challenged Hobart to a race during the upcoming town arts festival. The winner of the race was Bob Brown of nearby Eureka, who created a smoke-emitting turtle that laid eggs. The race received broad publicity when photos of a congressman riding the Pentacycle were seen nationally. In the 1970s, that original racecourse grew and got more technically challenging, spanning three days including major segments on water, mud, and sand dunes along the Pacific Coast. With the expansion of Kinetic Sculpture Races to other locations including Baltimore, Ventura, CA, Port Townsend, WA, and a few others, the original race is now known as the Kinetic Grand Championship. It starts in the town of Arcata, continues through Eureka, and finishes in Ferndale, all within Humboldt County. You can read more about the history of Kinetic Sculpture Races in California and throughout the world on Wikipedia, which also has links to more sources. To learn more about this race, click here!